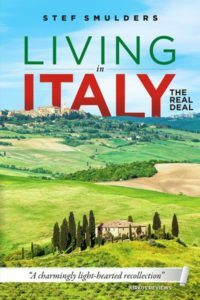 To appease your hunger, while waiting for the late Italian meal, you may want to try the Italian happy hour or aperitivo , a real tradition in Milan and other cities all over Italy. Though the precise rules differ from bar to bar, the general idea is that you order a drink at a slightly higher price than usual, after which you either get some (very tasty tapas like) snacks at you table, or (better still) you may serve yourself at a rich buffet at or near the counter. Here are some of the best aperitivo bars of Milan. 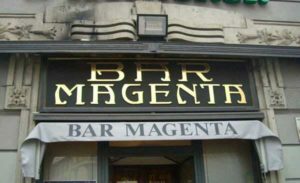 Listed in every guidebook the Bar Magenta is about the most famous bar of Milan. 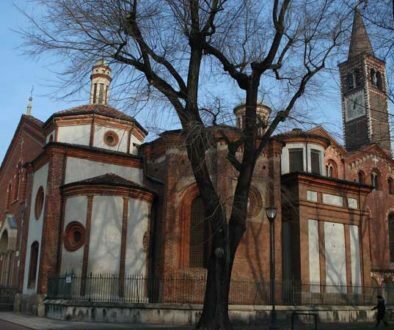 It is located south of Cadorna square , going south in the direction of the Sant’Ambrogio . 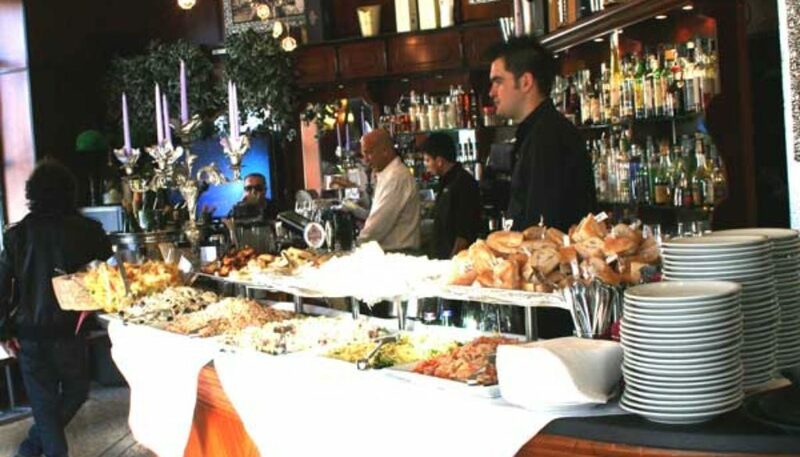 Bar Magenta exists for over a century and started the now very popular aperitivo phenomenon. It has recently been renovated and looks like a young lady again! Liberty style! Specialty of the bar is it’s wide choice of beers. Magenta also offers the famous Negroni cocktail . Pay first at the cashier. 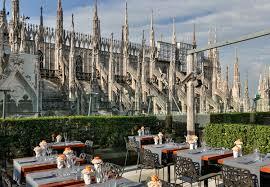 At a stone’s throw from the Duomo lies the Straf bar, which is actually part of a design hotel of the same name. The happy hour is often enlivened by DJ set and live music, and starts from 6. 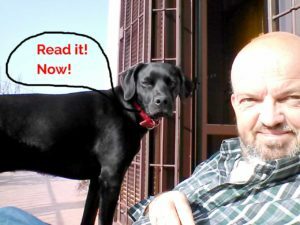 For actual news and upcoming events you may want to go to the Events page of the bar. This is a historic spot , over 50 years of age, as it is in this bar the the Milanese gusto for cocktails was created. The bar still offers a range of it’s own inventions (over 1500) and classics. The bar is located east of Corso Buenos Aires , along Via Plinio . I don’t think it is worth a detour, but in case you are nearby, have a look. Bar Basso does not serve draft beer or choice of wine, but just liquor and cocktails. The house special is the Negroni Sbagliato ( Negroni the wrong way) made with 1/3 spumante (sparkling white wine, instead of gin, that’s why it’s ‘wrong’), 1/3 Martini Rosso , 1/3 Campari . And then there is also the Mangia e bevi , invented 35 years ago, patented, with gelato , fresh fruit and liquor. Among the wide choice of aperitivo bars in Milan, this one is a peculiarity as it serves a tapas kind of aperitivo food. Bar Frank is a small place, directly north of the Giardini Pubblici . Every Thursday evening there is the Vintage Club with Radio105 classics ; on Sunday evening Lounge & Deep music. Bar Frank has a Facebook fan page . On the 7th floor of the La Rinascente department store, adjacent to and with a view of the Duomo , you’ll find what may be called a Food Hall . It is a collection of bars, a brunch restaurant, an enoteca , a market, an Italian food specialty shop and a terrace that faces the cathedral. La Rinascente is almost always open and offers a very nice place to lounge after shopping and/or sightseeing. Note : the space tends to be rather noisy and crowded, not recommended if you are looking for a tranquil spot. This is a modern style wine bar and restaurant in city center, south west of the Duomo . Apart from the wide range of wines on offer, there is a happy hour aperitivo and lunch restaurant (the closing time is 8pm). There are two menu’s with light, tasteful and varied dishes: a traditional one and one with more fantasy to it. As the venue is located on top of ancient Roman tower ruins , there is the possibility to visit the basement and see some of the remains. Next to the pizzeria-restaurant of the same name is this bar in Liberty-style setting. 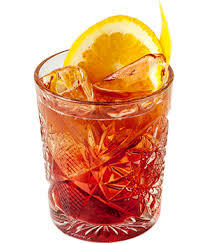 The Victoria is a classic, also for its aperitivo (6-9) and very conveniently located in city center, close to the Scala . Crowded at times with the young, rich and handsome(?) of the banker’s district. 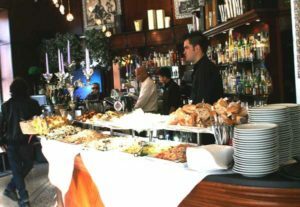 This café-bar is close to the Parco delle Basiliche in city center and is famous for its rich aperitivo buffet, on which you’ll find: bruschette, gnocco fritto alla piacentina, affettati, pasta, crocchette , couscous, pasta salads, frittate and so on. Large terrace outside. There are few of these wine bars of Manuela in Milan, of which this one is closest to city center and the best known one. 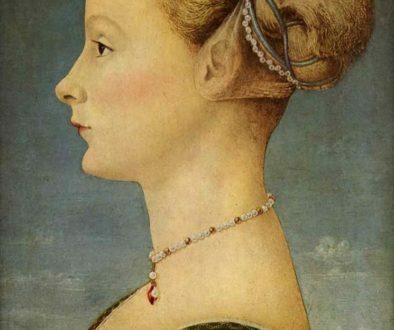 The others are north of Parco Sempione and west of Corso Vercelli . To accompany the best of wines (of course) there are entrees of cold cuts and cheese, but there is also a full traditional menu, that changes every month. From May till October you can also sit outside. It is not one of the cheaper spots, but the price quality ratio is good. This is a bar that tends to be overcrowded with the creative geniuses of Milan. People are usually overflowing into the street with drinks in their hands. 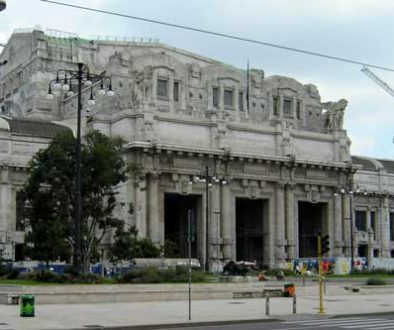 It is located just outside city center, near Porta Genova . There is a rich aperitivo buffet from 6-9pm, but also a menu to choose from. This brewer of craft beers , that contain no preservatives, started in 1996 and gradually extended its range to over 10 types of beer. The beer can be tasted at the bar at the brewery in the Lambrate district, in the direction of Parco Lambro and also at the bar in Via Golgi 60 . The bar offers a wide selection of beers and also an extensive happy hour , with many snacks and salads. The beers range from a light 5% blond or red to a heavy 8.5% dark ale. The very informative website of the bar-brewery tells you about everything you always wanted to know, but never … In case you need even more, download the birreria ‘s App . The beers of this brewer can also be tasted at some other bars closer to city center, like at Hop , right in front of the Rotonda della Besana . 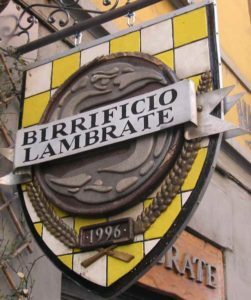 A full list is given on the Birrificio website.